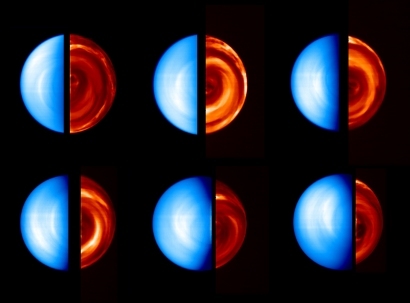 This sequence of images was taken by the Ultraviolet/Visible/Near-Infrared spectrometer (VIRTIS) between 12 and 19 April 2006, during the capture orbit around Venus. Each image is the composite of the day side of Venus (left, in blue, taken in ultraviolet light at 380 nm) and the night side (right, in red, taken in infrared light at 1.7 μm). The ultraviolet part shows solar radiation reflected by the atmosphere. The infrared part shows complex cloud structures, revealed by the thermal radiation coming up from different atmospheric depths. Venus Express can resolve these structures by use (for the first time from orbit) of the infrared windows present in the atmosphere of Venus. In fact, if observed at certain wavelengths, it is possible to detect thermal radiation coming from the deepest atmospheric layers, revealing what lies beneath the dense cloud layers situated at about 60 kilometres altitude. In the colour scheme of the presented infrared images, the brighter the colour, the more radiation comes up from the lower layers.